I hope you aren't tired of all these posts with Ink and Fairydust! This issue, I wrote a photography article (24 and 25) and another comic (30). Enjoy! And don't forget to check out old issues at Ink and Fairydust's Issu page. I told you "long ago" about my various sewing projects... namely, the three things I have sewn: 1) a doll dress whose pattern I made up 2) a skirt and 3) an Elvish dress. It is very hard, when you are the photographer, to get pictures of yourself dressed up. I do not have any pictures of my Elvish dress. The pictures I am including in this post are ones that my brother W. took several months ago-- and only when I bribed him. FYI: To get what "Bear" and "Fish" mean, read the Fairy Tale Novels by Regina Doman. And to get what "Tree Walking" is about, join the FairyTaleNovels Fourm, and read page 400 something in the Rivendell thread in the roleplaying section. Haha. These are more pictures of the design that, for lack of a better name, I am calling the "Twisty Design". The green and blue one is my favorite... those are my absolute favorite shades of my absolute favorite colors. The problem is, I didn't think about making it big enough to fit me. I made it the same size as the pearly one, but that one didn't fit me. So this bracelet is going to be a Christmas present for someone who does not have a ginormous wrist. :) And I'll make myself one later. I made the pink and white one with G. I can't believe how many things we made in just a few hours! I think this would make a nice Easter bracelet. Remember that post a few months ago when I claimed I would never again try to crochet with wire? Well, I guess I lied. A few weeks ago I got to see some of the spectacularly amazing jewelry my friend D. made. 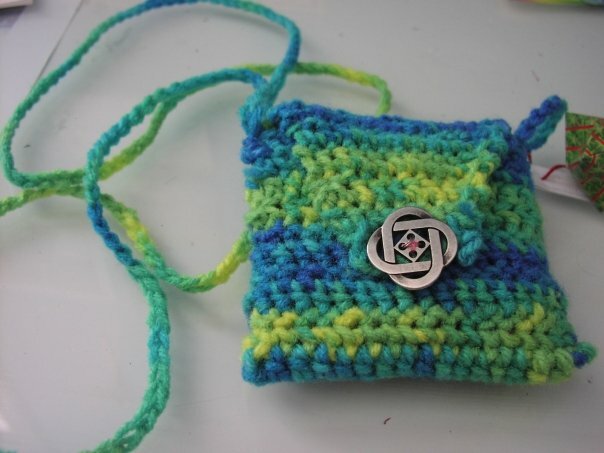 She had made several crocheted necklaces. They were amazing! So, of course, I had to ask just what she did to make them. Turns out the easiest way to wire crochet is to string beads onto wire, then chain stitch a length, pulling up a new bead each time you yo over. This is my first attempt at it-- I crocheted two strands and twisted them together into a bracelet. I think it turned out rather nicely. :) The below picture is the same bracelet, before I smushed the wire together. I definately prefer the smashed together look. This is another fun design that G. and I came up with! Actually, most of it was her idea. :) My jewelry is normally very delicate, or at least very swirly and sparkly. I was very pleased with this fun, bold design. I actually did not make this one; G. made it for me. I made one for G. but forgot to grab a picture of it. The centerpeice is a big button! It was left over from some Christmas projects I made a few years ago (see bottom picture). The ribbon threaded through twisty wire was a nice touch. A few days ago, I had a friend over whose ears are not peirced. She's never had earrings, and I dug up some cheap clip on (techincally, screw-on) things. We had fun with hot glue, beads, and wire! G. had some great ideas that I never would have thought of-- for example, putting buttons on earrings! I just realized I forgot to snag a picture of the first pair we made. It looked alot like the bottom one, only the rose bead was a bronze one I found at a garage sale, and the dangle was a clear yellow E-bead. Don't ask me why they are called E beads. I really don't know. My entire family are Lord of the Rings geeks. :) N., W., and I all dressed up as LotR characters. B. was going to; but his Gimli costume was packed. I suppose I could search for an old picture of him wearing it! M. was going to be King Theoden, but wouldn't wear the cape. So he was a firefighter. A. was a cute little bunny rabbit! N. as Frodo Baggins. Note that he is wearing the Ring of Power- he filched that from B. 's LotR Risk game! W. as Aragorn. Note that he stole my Evenstar. The three LotR characters! I wasn't exactly Arwen, just a random Elf. :) That costume is the big sewing project I've been working on! More pictrues of it will come someday! And I will take pictures of the jewelry I made to go with the costume. In the latest issue of Ink and Fairydust, I wrote an article on writing with the Elvish characters called Tengwar. There wasn't room so it got shortened. I have decided, for simplicity's sake, to remove the Read More option on posts. I've found it sufficiently difficult to navigate the blog with these little jumpbreaks hopping around like mad hatters, and I do not want to get rid of the "You may also like" widget. As I get more time, I will set about removing the Read More from previous posts. Beware of very-long lists full of pictures and instructions! As mentioned several times, I am participating in NaNoWriMo. I must say that my first day of literary suicide succeeded. I reached 1,929 words. I was hoping to get somewhere in the 2,200 word mark, but that was not accomplished for a variety of reasons. 1) I was not allowed to stay up until midnight, November 1st and begin writing at the first moment, and 2) I fought with my brother (...we all do that, don't we?...) and nearly lost computer privlages for two days. While playing pirates in a deserted attic, quirky Claire and shy Edmund stumble upon a mysterious door. On the other side, they find a land ridden with wonder and danger, friendship and enmity... and rumors of the Balmung, an evil sword that gives power to the corrupted ones. Claire and Edmund are unwittingly thrown into the middle of a conspiracy to undermine a witch's power. The conspiracy evolves into a quest to find the legendary Seeing Masks... and the fate of the world could rest in the hands of four young children. Also, the latest issue of Ink and Fairydust came out! Here is my post about the October issue, which explains what I&F is. 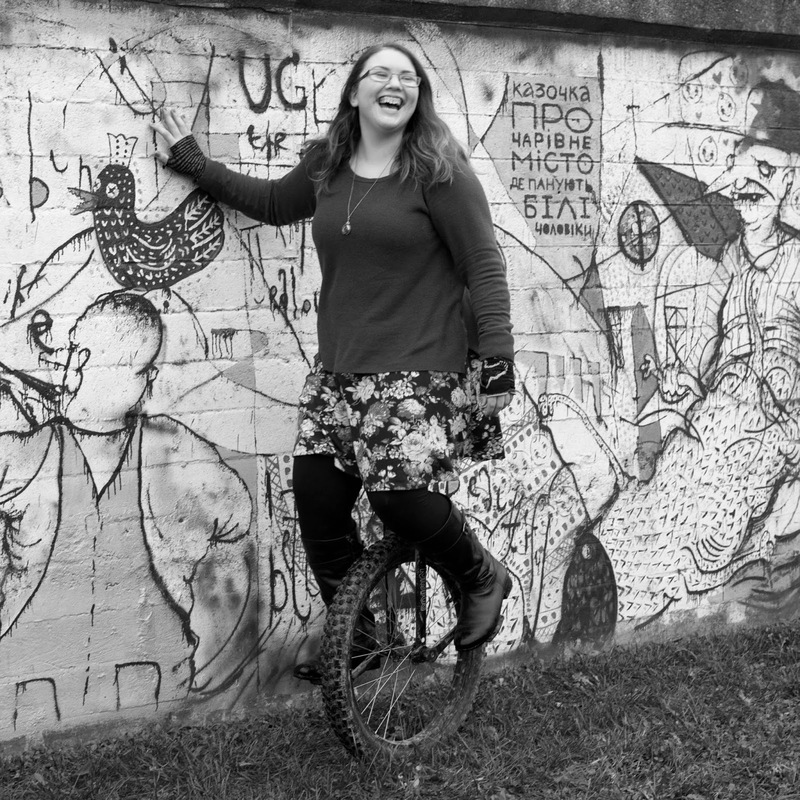 Our awesome fourm administrator, Elena, found herself sick with far too much time on her hands. As a result, our three-month-old monthly newsletter is now in magazine format! She is still working out the kinks in it (all capital "N"s are invisible...) but I hope you enjoy it! For those of you (I'm thinking my grandparents here) who really don't care about Shakespeare, but only want to see what I have written, I have two articles on pages 34 and 35 and a comic strip on page 42. However, I suggest reading the entire thing! Or at least the articles that catch your eye! The entire article on Elvish writing was not included (I feel this is a good thing as I gave a rather long winded and confusing explanation), so at some point I will post it on my blog. Just in case any of you feel like learning Tengwar! Anway, here is the latest issue! I think I mentioned before that I am participating in NaNoWriMo (National Novel Writing Month). In order to do this, I will be forfeiting a good portion, if not all, of my computer time. I do have several things to post (Halloween costumes... shaln't say more! ), but that will have to wait until I have time to upload, edit, and post the pictures! So hold tight until I get a chance to post! How to do a "pen and pencil" drawing, which is what alot of my artwork that are not sketches are. ... color it in! Use those shadows you colored in before! Don't be afraid to pull out your pens and go over any black line that gets smeared by pencil. The effect is a fun picture with very dramatic lighting! But WAIT! We're not done! Step 5) Take pictures of the drawing from weird angles, just because you can! and... 6) Post them on your blog because you think that the picture above is simply hilarious! 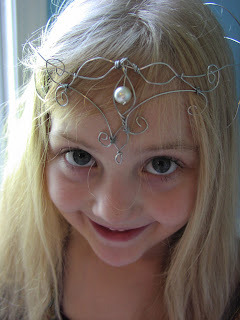 Here is a recent creation- a very fancy ear cuff! I used Czech glass leaf beads. The two pictures shown below show how amazing these leaves are. They change color with the light! Both pictures are of the same ear cuff. The one on the right was taken with a yellow-y natural light, and the one on the left was taken with a white flash. This is my favorite earcuff so far! As always, the earcuff can be worn with earrings. I know the heart one doesn't match. Oh well. I don't know though- with this particular ear cuff, is it overkill? The pictures below show more of the ear cuff... for those of you who would like to peice together how I made it. I really can't explain. The new widget seen at the bottom of posts is this thing called "Link Within", and it shows other posts that are related. Unfortunately, (and I haven't messed with the HTML to fix this yet) this gets in the way of my "jump breaks" on posts, where it allows me to put a READ MORE. The jump break makes it easier to navigate the blog, but now it is hidden below the Link Within widget. On all new posts, please peek underneath the widget to make sure that you are not missing half the post! Lack of updates? Oh my! 1) School. High school, to be precise. Homeschooling with Kolbe Academy and honors in most subjects typically eats up alot of time. 2) Family. We are still trying to sell our house, Dad is commuting for the time being, my grandpa is sick, and we have lots of activities. 3) Sports. I am playing volleyball, and 4 out of 5 siblings are doing other sports. When I don't have volleyball myself, I am babysitting various siblings while Mom takes the others to practices/games/tournaments. This should be over come last week of October. The fourm, where I spend 90% of my computer time, is manned by faithfilled, crazy fans of Regina Doman (people like myself, in other words). We have interesting discussions on everything from religion to music, random discussions on everything from school to ear wax, and of course the Family Tree, which is a major roleplaying section. Book reviews by fellow teens, sharing and critiquing of art, poetry, and other scribblings... Anyways, it is wonderful. Here is the second issue of our newsletter. My article is on page 8 and my comic strip is on page 4. I suggest printing out the entire newsletter and reading all of it- it is worth it. This is my favorite creation so far! I hope to make a matching necklace sometime. This was almost insanely easy, and it looks so classy. First, I put a bead through floral wire. Next, I shaped the 20 ga wire to mold around the bead. Then I twisted the floral wire that the bead is in around the 20 ga wire. Repeat until the bracelet is finished! A Bottle of Pixie Dust! This is made from an old plastic perfume bottle that my little sister had. I "weathered" (rubbed pastel or ink with a sponge) the paper, calligraphied it, and attached it with rubber cement. (glue works, too). I filled the bottle with water and glitter (shhh! Its pixie dust to the little ones! ), colored the lid with Sharpies, glued a flower on top, and tied ribbon on. Ta Dah! This was very fun to make! 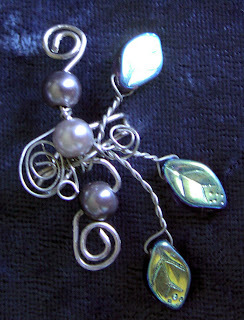 First I made the two dangles (or wirewrapped loops) that the glass pearls are on. Then I twisted the heart shape, putting the dangle into the bottom loop. Then I attached it to the earring hoops! For the ring, I put a long strip of wire through the bead and pulled it backwards. Hopefully you can see that in the picture. I twisted it around my finger. I twisted floral wire around the spot where the bottom of the heart is. Then I simply twisted the ends of the 20 ga wire into a heart shape! 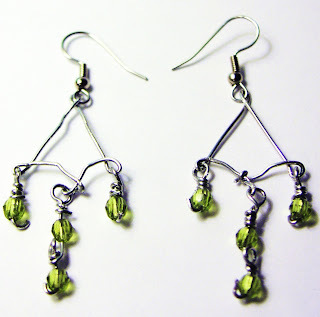 These chandelier earrings were a ton of fun to make! They were quite a puzzle to put together, though... except for the actual loop that goes into the ear, this is entirely handmade. I took a strip of wire and made a triangle with two loops in the bottom corner. The ends of the wire are attached to the middle beads. The twisted ties on the beads took a bit to get the hang of, but are fairly simple. You curl the end of the wire and thread the bead on. Next, form a loop with your pliers slightly above the bead. Keeping the pliers in the loop, take the rest of the wire and twist it three times around the wire directly below the pliers. Such silver filigree as never known! Such delicacy, detail, wonders to behold! And then, to the greatest of all dismays, dashing wild hopeful hopes to the ground and slathering them with the mud of disappointed, I made the amazing discovery that... any replica, of whatsoever quality, costeth at least $30. The beautiful detailed intricate creations... somewhere in the $200 range. The hook in the back was made with a beaded chain with an S-hook at the end. 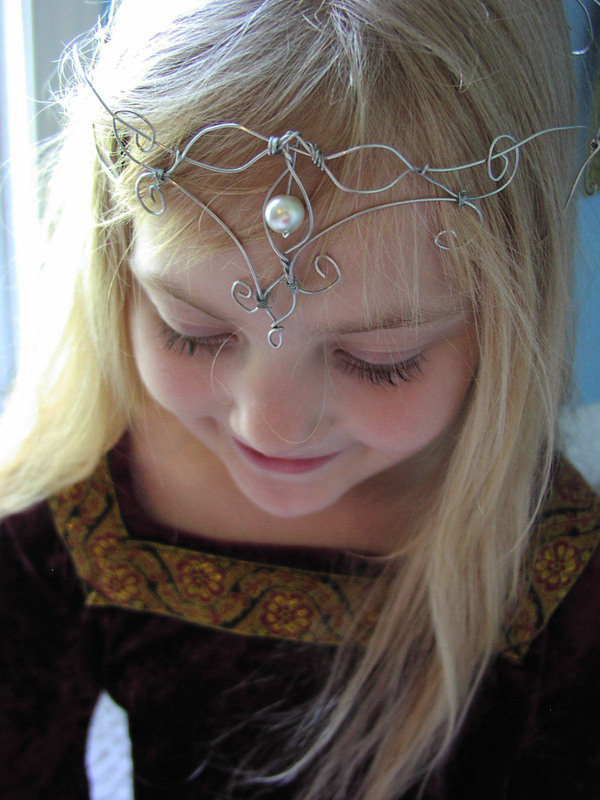 With this chain, there is no need to secure the circlet with clippies! My apologies for a lack of better pictures. Sometime I will try to get one with a black background. Guess who got pictures-- nearly a year later?! 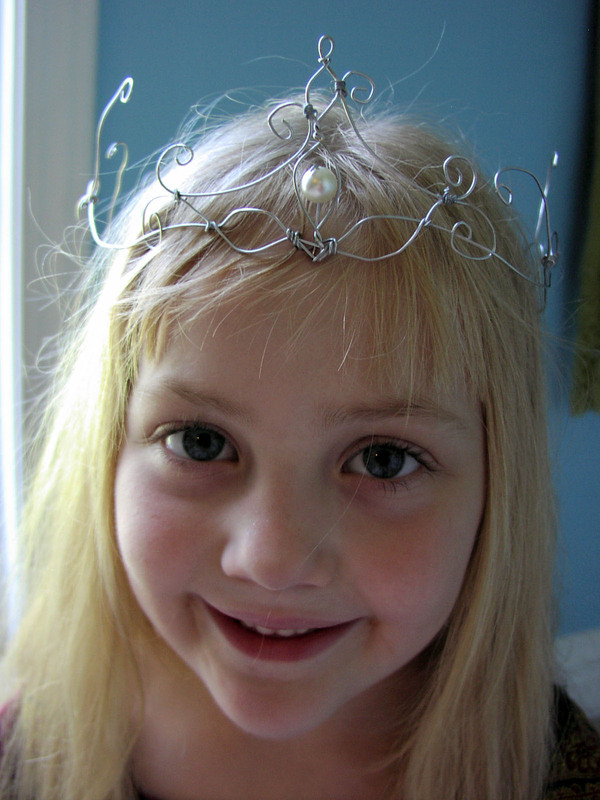 This has been a favorite tiara with all the little (and not so little!) girls playing over at our house! You can definitely see the wear and tear (and bending, from the swirls tangling in hair, which I didn't bother to correct) in these pictures. Sorry there is so many; my sister was such a compliant model and too sweet. On black; the one twist has obviously slid up. An easy fix had I caught it before I snagged the picture. It can be worn as a crown instead of tiara! She got a little annoyed at the end... she wanted to play princess, not take pictures!